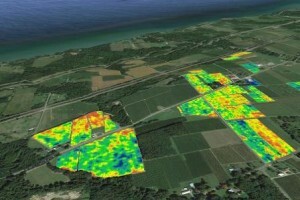 Concord vineyards along the shore of Lake Erie overlaid with spatial sensor canopy data. In this case, blue areas show vines with strong growth and high production and red areas show problem areas of poor growth and production. In conjunction with other spatial data layers, such as soil and yield maps, vineyard managers can develop variable rate management plans for their vineyards to reduce variation and improve production and fruit quality. Cornell University researchers are working on a project that will give grape growers access to digital maps detailing the health of their vineyards at a level never before achieved. The project, led by Terry Bates, director of the Cornell Lake Erie Research and Extension Lab in the College of Agriculture and Life Sciences (CALS), received $6 million in federal funding. “The purpose of the project is to be able to measure and manage the natural spatial variability in vineyards,” Bates says. Mobile sensors are hooked up to tractors or ATVs while growers perform other vineyard activities. For example, there’s a sensor that measures soil electrical conductivity, and another sensor is pointed at the sidewall of the canopy to measure it as the grower drives through the vineyard. The soil sensors already exist, as do sensors for measuring canopy. A yield monitor is also available that mounts on a grape harvester and can measure the weight of the grapes as they come off the vine. The task now is to create a sensor that can sense what size the crop is early in the season, non-destructively. Carnegie Mellon University researchers are in the process of developing an ATV-mounted crop sensor that can detect berries as the grower drives through the vineyard. The goal is to do this early- or mid-season to create a spatial map of what the yield is likely to be. The ultimate goal is for these layered maps to help growers make wiser, well-informed vineyard management decisions. “We can get an after-the-fact yield off the grape yield monitor that anyone can buy, but we’re trying to also develop this early-season or mid-season image analysis to give us the same thing, but give it to us at a time when we can actually do something about the crop,” Bates says. For example, if a crop is too heavy in one side of the vineyard and light in the other side, the crop can be thinned on the heavy side, and growers can prepare for early ripening on the light side, which can help with harvest planning. Once the sensor development is complete, the next step is to establish and test the variable rate management, Bates says. Researchers will be looking at whether variable rate management does indeed save the grower money by lowering production costs and improving juice quality. Bates adds that while he began work on the project in New York, the California wine and table grape industries are heavily vested in the project. Four test sites have been set up in California, in addition to one in New York. Wow academia is far behind and happy to keep the Feds unaware…irresponsible use of taxpayer dollars. Another example of academic welfare!!! Commercial high resolution digital imagery (specifically for Ag) has been available for 20 years and used by growers in every state specifically to improve vineyard management. In the late 90’s NASA/USDA had the “GRAPES” program, then the “CRUSH” program along with the $20+ mil they blew on Resource21. I guess Mr Bates didn’t even bother to look at peer review articles, not to mention what was available from the commercial remote sensing industry. I am stunned they didn’t include drones, “big data”, or LANDSAT in the proposal? With co-conspirators like Senator Schumer and Senator Gillibrand how could they go wrong! Dan is right, I hear the flushing of our tax dollars once again!!! Well said Dan and Stan. Yes, what a scam and rip-off indeed. There is nothing mentioned in the article that is new or innovative. Most of what was described has been commercially implemented for 15+ years, see: http://www.ag-recon.com/files/GrapeAps.pdf. Note the the Copyright of 2003. There are many other commercial providers doing the same or more these days. I am sick of the government using our tax $s to reinvent what we are already doing and to use those $s to compete with commercial enterprises. “GRAPES” and “CRUSH” took many $s out our our pockets during those years. Shame on these guys and shame on whoever “awarded” them the grant.